We have provided a useful 'Product Guide' key on each of the product pages on the website. This will help you see the features of each of our sock styles, and help you decide which socks to select to suit your needs. Below is a glossary of the terms used in the Product Guide. 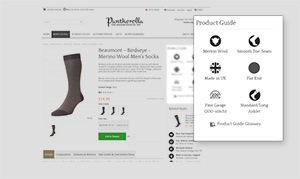 The majority of Pantherella men's socks are available in a standard/ long anklet length. Our standard socks are slightly longer than the regular socks you would find on the high street, ensuring there is no show of the leg with a shorter trouser, the perfect sock for a gentleman. Our standard length socks are available in a collection of colours, textures and patterns. Over the Calf socks from Pantherella are the perfect choice for the gentlemen who are seeking long socks that come up above the calf. Made with Pantherella's signature quality and attention to detail, our over the calf socks are available in a wide range of key styles. There are also tailored over the calf dress socks for those looking for the ultimate refinement in their long dress socks. Footlet socks are hidden socks that are worn perfectly underneath shoes, espadrilles and even trainers for the ultimate in comfort, style and practicality. Designed using Pantherella's signature attention to detail and world’s finest yarns these Egyptian Cotton socks will be your go-to discreet socks. Pantherella's standard ladies short length socks are available in the finest of yarns and are the perfect length for a short ladies sock, finishing just above the ankle. Our most popular ladies length, you will find the majority of our socks come in this perfect length. Our ladies knee-high socks are a great length (coming up to the knee) to wear pulled up with boots or ruched down for ultimate comfort. They are wonderfully soft and made with the finest fabrics, available in a range of colours and yarns for every occasion. Pantherella knits socks at different gauges, and an indication as to the gauge of a sock is the number of stitches required around the circumference of the leg of the sock. At Pantherella, the number of stitches ranges from 96 to 240. 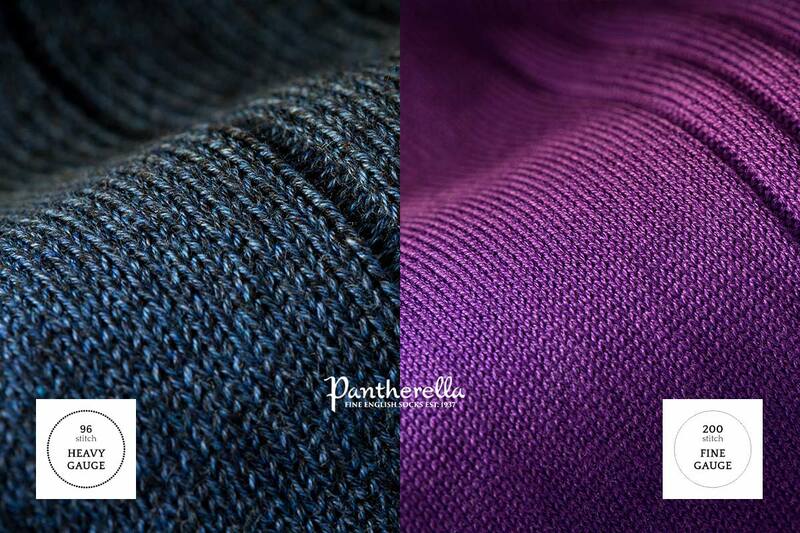 At Pantherella, a fine gauge sock is created from extremely fine yarns using a cylinder knitting machine holding 176, 200 or 240 very thin knitting needles (1/50th of an inch thick). The more stitches, the finer the gauge. At Pantherella we knit some of our special tailored socks on a 240-needle superfine gauge knitting machine. This means they are the finest socks which we stock, perfect for a black-tie dress occasion and uniquely tailored, meaning they will be the perfect fit. For Pantherella, a fine gauge sock refers to a sock created from extremely fine yarns using a cylinder knitting machine holding 200 or 176 very thin knitting needles (1/50th of an inch thick). This means that there will be 200 or 176 (dependent on gauge size) finely crafted stitches around the leg of each and every sock. Pantherella uses a fine gauge stich (or even the Superfine gauge) on all the Pantherella dress socks in the collection. The leisure knit socks at Pantherella are thicker than our standard dress socks, and have 96-stitches round the circumference of the sock. These socks are usually worn for leisure around the house or with casual shoes, trainers or boots at the weekend. Ribbed socks have been a firm favourite at Pantherella since 1937, due to the classic appearance and functionality of the sock. They are composed of vertical ridges of varying widths giving them extra stretch, and preferred by some due to the way this holds the sock up against the leg. At Pantherella we do not have one sized rib which works for every sock. The designers at Pantherella choose the size and number of ribs carefully, to create the finish and look they desire. One of our most popular rib sizes is the 5x3 rib, which is produced using 5 cylinder needles and 3 dial needles, which then creates the ribbed effect. Our herringbone ribbed socks are constructed in the same way as a regular ribbed sock, composed with vertical ridges of varying widths. However, what differentiates it from a regular rib is the herringbone pattern of the sock. Flat knitted socks from Pantherella are a style staple, giving a smooth texture all the way around. Expertly hand-finished to Pantherella’s signature high standards, they will give you premium socks that are a durable and reliable addition to your collection. Our flat knit socks are available in wide array of colours and styles, which will complement virtually any outfit. Our textured socks are created with the finest of yarns, and combine classic patterns with textured designs. Textured socks are the perfect addition to an outfit when you are wanting to add some extra personality and a contrasting fabric. The majority of Pantherella socks feature the famous Pantherella 'seamless' toe, as you'd expect with socks of this quality. Regular toe seams can feel bulky and uncomfortable to some. Our smooth toe-seams are basically seamless, leaving them feeling comfortable and luxurious. All our fine gauge dress socks feature the signature Pantherella seamless toe. Non-elastic socks from Pantherella have a graduated rib with relaxation panels at the top of the sock that gently grip the leg, and stay up without need for elastic. Pantherella Relaxation socks allows for natural circulation around the leg and eliminates marks and irritations, using the original Softop™ patented design. The coat of the Merino breed of sheep is synonymous with the production of fine, soft wool with excellent body temperature regulating properties. Merino wool provides warmth, without overheating the wearer and also draws moisture away from the skin. All the Merino wool used by Pantherella is worsted spun which ensures strength and the long fibres help to give our socks their characteristic soft surface handle. Standard Merino wool has a fibre diameter around 25 microns. Here at Pantherella we use a 19.5 micron yarn which is classed as ‘superfine’ and is exclusively spun with 10% nylon which gives it extra durability for everyday wear. Our 100% pure ‘Superfine 100s’ is the ultimate in superfine merino wool with a fibre diameter finer than 18.5 microns. This finer wool is capable of being spun into finer "yarn counts", which in turn can be knitted into thinner socks with a supremely soft handle, or feel. The wool used in Pantherella socks has a beautifully soft handle, that feels great against the skin, but also provides a durability that means the sock will last repeated wears and washes without wearing thin or losing the strength of colour. Due to its unrivalled softness, warmth and comfort, Cashmere is considered to be one of the most desirable fibres in the world. Cashmere is one of the finest natural fibres in the world and is obtained from the hair of cashmere goats (Capra Hircus Laniger). Pantherella cashmere comes from Mongolia, where around 40 million goats contend with winter temperatures as low as -30°C. Due to the low temperatures, their coat is made up of two distinct layers – the outer layer (guard hair) and the undercoat (cashmere). The guard hair is coarse and waterproof, which serves to protect the goat (and the undercoat). The undercoat is ultrafine, soft and an excellent insulator, to protect the goat from the extreme cold. Only the soft, ultrafine undercoat is used to produce cashmere. In spring, as the goats moult for summer, they are combed by hand to remove their ultra-fine undercoat, while leaving the guard hair intact. These combings are then washed and sorted to remove any stray guard hairs. What is left is pure cashmere. This laborious process results in a fibre that is exceptionally exquisite and rare. It therefore it commands a higher price than more easily obtained fibres. Our 100% pure cashmere sock yarn is worsted spun for extra durability with the longest staple fibre. One hundred per cent pure cashmere products are high quality, luxurious, rare, and therefore an investment. Our leisure weight cashmere yarn is woollen spun using the finest grade of cashmere knitted with nylon to give extra durability and stretch. An affordable taste of luxury. Exclusively spun in Italy for Pantherella to a special count for knitting into socks, Escorial is a rare and luxurious wool from a small sheep originating from the Spanish Royal flocks of El Escorial. Today these sheep are only to be found in small numbers in Australia and New Zealand. The Escorial fibre is naturally curly, like a coiled spring, which means that air is trapped between each strand providing greater bounce and insulation that ‘standard’ sheep’s wool. This natural flexible characteristic results in a warm, durable and extremely soft yarn with a natural elasticity which affords a superb comfort and fit. We use Giza 86 Long Staple Egyptian cotton, which is grown in the Nile delta in Egypt and spun and dyed in Italy. The long staple determines a high quality of cotton, as it uses uniform lengths of fibres of around 33 mm and from 4.3 to 4.9 micronaire. Multi-ended twists are used to achieve a thread count suitable for our thicker leisure weight socks which also enhances the strength, durability and superbly soft handle. For our mercerised Cotton Lisle socks, Pantherella use the finest Italian sourced, extra-long staple Egyptian grown cotton. The extra-long staple determines the highest quality of cotton, as it uses uniform lengths of fibres of over 33 mm. This yarn is composed of two strands that are twisted together with an extra twist per inch than lesser quality cottons, creating one single, strong thread. Once spun, the cotton goes through a process of Mercerisation (devised in 1844 by John Mercer of Great Harwood, Lancashire, England) whereby it is passed through a flame at high speed, to eliminate any stray surface fibres. The result is a shiny, shrink & pill resistant yarn that absorbs dye brilliantly while maintaining its silky lustre. Genuine West Indian Sea Island cotton is cultivated only in the perfect conditions of the British West Indies and rigorously certified by the WISICA (West Indian Sea Island Cotton Association). This rare and expensive raw material has the longest and finest cotton staple available which gives is its characteristic durability and silky, shiny look. Strong as silk, as soft as cashmere and as durable as wool. Our innovative cotton linen blend combines ‘zero’ spun cotton, with natural ecru linen. ‘Zero’ spun cotton is a rounded, clean yarn which uses technical advances in spinning to eliminate every trace of bobbling in the fibre resulting in longer wear and superior comfort. Linen is laborious to manufacture, but the fibre is very absorbent and garments made of linen are valued for their exceptional coolness and freshness in hot weather. When combined, these yarns give a unique two-colour mouline effect which is knitted into the perfect mid-weight leisure socks for the warmer Spring/Summer months. Silk is a naturally strong and lustrous fibre harvested in China from the continuous filament cocoon of the Mulberry silkworm. Pantherella use Swiss ‘Tram’ silk which is a yarn formed by twisting 2 to 3 strands together to produce a thread with luxurious shimmering appearance, excellent wearability and good moisture absorption. Even in warm conditions, silk socks remain cool & comfortable to wear, making them the ultimate evening dress sock. Unique to Pantherella, a few of our Cotton/Cashmere blend fine gauge socks, have additional Lurex for added sparkle. These socks are soft to touch and perfect for the party season. All of our socks are made in Leicester, England, and have been since 1937.